Manuel Ponce: Sonata #5 in D "Sonatina Méridional"
Carlos Rafael Rivera: Suite "Whirler of the dance"
The Villa-Lôbos disc comes on the heels of another CD featuring his complete works for solo guitar, played by David Leisner on the Azica label, which I reviewed for another publication. But there's a difference between the two issues: Leisner's contains the first recording of the original version of the Twelve Préludes from 1928, whereas this Naxos release is of the revised version. The author of the Naxos notes, Pierre Vidal, seems unaware that there are two versions, but he can hardly be blamed since the original was only recently unearthed and with little notice by the press. In any event, the differences between the two versions are not substantial, though in a few pieces there are some noticeable changes. In #10, for instance, Leisner takes 3:26 compared with Kraft's 1:52. The reason for this large gap is that Villa-Lôbos excised a large chunk right after the opening, probably at the behest of dedicatee Andrés Segovia. There are, of course, other changes throughout that I won't go into, since either version is perfectly acceptable. I marginally favor the original. 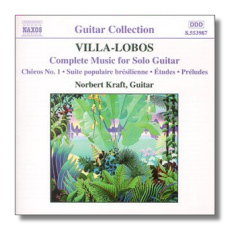 Aficionados of guitar music and Villa-Lôbos specialists, of course, will want both. But the larger question is, how do the guitarists compare? Kraft has more flair, while Leisner is content to adopt a less personal interpretive stance. In the end, both are compelling, but Kraft is preferable. A big factor to consider also is that Naxos offers superior sound and a lower price. Thus, those choosing to have only one version should opt for the Naxos. Kraft is brilliant in the colorful Chôros #1, too, and he renders the five pieces comprising the Suite Populaire Brésilienne and the Five Préludes, a slightly less attractive set than the Twelve Préludes, with flair and interpretive insight. By now, many are probably wondering, who is Norbert Kraft? I don't know – a splendid guitarist, is all I can say. The one failing of the people at Naxos here is that they offer no biographical information on him. His name appears in the accompanying materials only once – on the cover. 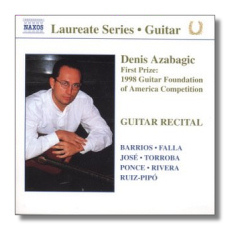 That's not the case with the artist on the second guitar disc here, Denis Azabagic, though there is no information on his education or teachers. Bosnian-born (1972), he's won a number of competitions, including the 1998 Guitar Foundation of America Competition. Azabagic is obviously a talented player, having the interpretive smarts, not to mention the technique to play anything he wants. He deftly captures the lightness and wit of the Torroba Sonatina (1925). In the Barrios La catedral he's alert to the wider range of colors and greater depth in this more reflective music. He delivers the Ponce Sonatina meridional (1932) with a keen eye (and ear) to its shifting moods and colors. Try his last movement, Fiesta, to sample his deft sense for color and brilliance. Azabagic shows the recently-published José Sonata (1933) to be a fine work. Again he displays his range and ability to capture moods and shifts. Try the dark and restless finale and you'll hear a fine example of his art. This José Sonata, by the way, may be the best work on the disc, owing to both its thematic and harmonic depth, which, in its blend of sweetness and melancholy in parts of the first movement, calls to mind some of the middle and late keyboard works of Liszt. The Ruiz-Pipo 3 Estancias (1970) and the de Falla Homenaje, pour le tombeau de Claude Debussy (1920) are both rendered with insight and feeling, as is the most recent work here, the Rivera Whirler of the dance (1970). This is a fine program, with the José Sonata definitely worth the price of admission alone. Naxos offers excellent sound, and buyers are likely to agree that guitarist Azabagic is an artist with a very promising future.